I’m sitting at my desk on Friday afternoon when I get a call from my man Big E. We rap about a few things and then he inquires as to what I was doing for the weekend. He informs me of a fishing trip that he’s hooking up for the fellas in Delaware for Sunday. Now, I’ve never gone fishing, but I’ve heard so many positive things from guys who’ve gone. Yes, I’m 34 years old and have never been fishing. Save the jokes aiiiight. Hell, even my fiancée told me stories of how she enjoyed fishing with her father. So I suppose you could say that for the first time in my life, I actually considered going. The way I always hear the fellas describe it, fishing sounds like going to the barbershop on the water. It seems like a place where the guys go to just relax, have fun and talk trash. Anyway, Saturday afternoon rolls around and Big E had told me to call him to let him know if I was going. Again, I was still contemplating. I don’t know what I was scared of, I just wasn’t sure. It wasn’t like I had anything else planned. I ran things by my sweetie, just to let her know what I was planning on doing and then I called my man back to give him the thumbs up. Oh boy, what had I just gottem myself into? I awoke to the sound of the alarm at 5:45am. I jumped out of bed and started my preparation. I threw on some khaki shorts, my gray Grindstone Universal Fisherman t-shirt and my New Balance kicks. I heard a sleepy feminine voice say to me “You don’t want to put on your good clothes, you might get them dirty with blood and stuff”. 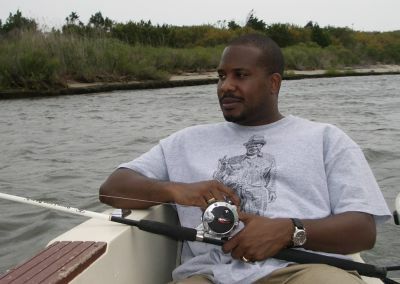 Now a brotha who has never been fishing before isn’t thinking about what to wear. I don’t think I have any bummy clothes. Hell, I make sure that my t-shirt, shorts and sneaks match just to take the trash outside. I decided to keep on what I had on and not worry about it. I ran to the kitchen, put together two peanut butter and jelly sandwiches, a Ziploc bag full of green grapes, two bananas and some bottles of Gatorade. As I was getting ready to walk out the bedroom door, my baby began to give me random tidbits of advice. “Do this”, “Don’t do that”, “What kind of fish are you guys going for?” “What kind of bait is he using?”. If I hadn’t felt green enough, she definitely nailed the coffin shut on me and my lack of knowledge on what I was getting ready to embark upon. I met up with Big E and my other partner GP around 7. I left my car in the parking lot at this hotel off Route 450, jumped in with the fellas and we began our journey down 50 towards Delaware. Now if I had any apprehension about what I was wearing, it all went away. My man GP was Nike’d down. It looked like he had just gone to Footlocker and copped an outfit just for the trip. Only thing was, he looked more suitable for the b-ball court than a boat. Come to find out that this was his first time fishing as well. Oh yeah, this was gonna be fun alright. About 1 1/2 hrs later we arrived at Big E’s folks house in Delaware. We all then piled into his cousin Drew’s truck where the boat was hitched onto the back and headed to the spot. To be honest I had no idea where we were. I don’t know the name of the place or what part of Delaware we ended up in. All I know is that there were tons of boats. Big E’s brother Dave met us up there and the adventure began. We loaded up the boat with all the necessary things for the trip and all piled in. Big E drove the boat about 8 miles from shore and then turned the motor off. I stood up from where I was sitting only to quickly realize that I was way off balance due to the placement of the boat and the roughness of the waves. I’m saying to myself “Folks actually stand up on this unbalanced boat and try to catch fish like this?” This was indeed going to be real fun. It was about 11:30am at this point and I had no clue what the hell I was doing. Big E laced up a rod for me, threw some squid on the hook, gave me some instructions on how to use the rod and turned me loose. I sat there at the nose of the boat for about 15 minutes and nothing happened. Now you know that every time the current hit hard, I thought I had something on the hook. Wrong! A few moments later I hear my man GP at the back of the boat hollering. I turned just in time to see his rod bending toward the water and him trying to reel that thing in. Yep, he had caught his first one. It was a King fish. Don’t ask me what a King fish is, that’s what the other fellas said it was. 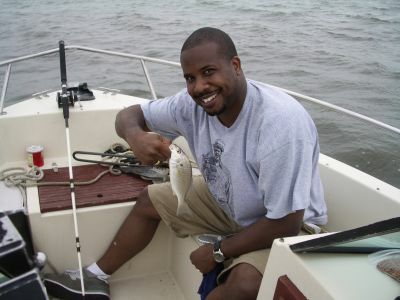 I grabbed my digital camera off my hip and took a few pics of his with his first catch. I then sat and wondered when or if I would catch one. Big E started the boat and drove to another location. Again, we all took up positions around the boat and threw our lines in. I was sitting there chillin’ when all of a sudden I felt a tug on my rod. I jumped up and started to reel it in. Oooops, I was turning it the wrong way. Big E same me messing up and came over with the quickness. He was able to save me. After a handful of turns, the line came out of the water and low and behold there was a fish. My first catch. The guys didn’t seem to excited. “It’s a baby Croaker”, Dave said. “You gotta throw him back”. Awww maaaaan. I was cool with that, but I was gonna take a picture of my first catch ever, even if I had to throw him back. So I handed Big E my camera and he took the pic. It was exactly 12:19pm when I made the catch. However according to the ‘rules’ I threw the lil’ baby fish back in the water. For the next several hours we sat there on the water. I got seasick and it was nothing nice. The queasiness was awful. I tried to drink Sprite, but that didn’t work. Big E finally gave me some Dramamine for motion sickness. It cured that, but then I got dizzy and a lil’ bit sleepy from that medicine. I sat down and watched the guys for about 45 minutes or so until I got myself together. I still couldn’t get myself to eat my sandwiches and snacks though. Shortly thereafter I got up with a full burst of energy. I caught 3 more fish, 2 Spots and a White Perch. The White Perch was too small and he had to be thrown back too. The other experienced guys weren’t exactly having career days. GP and I had caught more fish than they had. It was kind of funny. The two guys who didn’t know what they were doing were catching the most fish. The next thing you know I was feeling good. It was cool being out there with the guys. We were all out there talking trash about this, that and whatever. I felt stable enough to eat and devoured my sandwiches and my grapes. My baby called my cell periodically to check on me. It felt pretty good to tell her that I had caught a few. Lord knows I would’ve felt funny coming back home empty handed. At around 5pm or so we finished and drove back to the dock. From there we loaded Drew’s truck and went back to Big E’s peoples house. In the cooler there were all of 8 total fish, more than half were caught by myself and GP. I didn’t want them though. I wasn’t gonna clean those bad boys. Big E bagged them and gave them to GP so he could take to his folks house. I hopped in the backseat of Big E’s car and nodded off to sleep. I was tired. I really was. My face was all salty and I truly was drained. When I got home around 8:30, I immediately jumped in the shower. This had been a full day. But cha know what? I had a good time out there. My first experience fishing (minus the motion sickness for an hour or so) was a good one. I can honestly say that I really enjoyed myself. 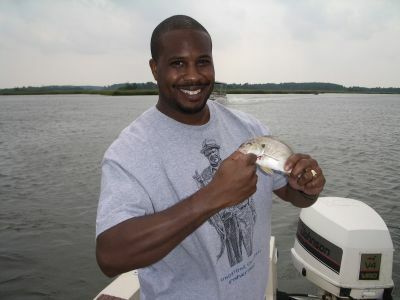 I better not say that too loud though cuz Big E likes to fish like every week. This brotha loves to fish on the regular. An outing here or there is cool with me, but I’m not ready to become a full-time fisherman yet. This is my 6th straight year being involved in fantasy football. I started playing in 2001 with some co-workers and things have quickly escalated to unbelievable levels. 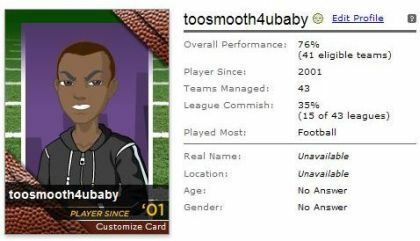 Although I primarily play on Yahoo, I’ve been part of countless leagues on a number of different sites. In addition to football, I’ve played basketball, baseball, hockey, NCAA March Madness pools and weekly NFL Pick’Em pools. I’ve played on CBS Sportsline, Sandbox, EA Sports and others. To my credit, I’ve been very successful over the years. In fact, I’m so successful at it that I now put out a good amount of money for various leagues. 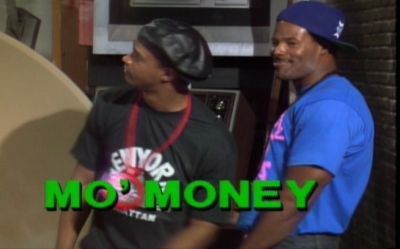 This upcoming football season, I’m registered for 5 leagues and 3 of them are for money. My biggest investment is $100 for this league I’m in at the office. I can win up to $1000 if I can successfully create a powerhouse team. The live draft for that league is this Friday. Trust me, I’ve got tons and tons of paperwork on player stats, projections and injury reports. So when we all meet at the restaurant Friday evening and get this thing going, it’s gonna be serious. Hell, last Friday night I sat with my fiancée at her live draft and played the role of GM. Yes, she’s a huge football fan and plays too. Her draft wasn’t even in a league for money and I was amped up for close to 3 hours helping her with that one. I’m not sure how I ended up hooked on this stuff. I mean, I’ve always been a big time sports fan. My pops worked for the Bullets when I was kid, so I’ve always been around sports. I grew up going to lots of games, football and basketball alike. I was always the kid who knew every single detail about a game the night before and would talk endlessly about it the next day at school with my buddies. But the addiction to fantasy sports has taken me to a new high. I now can utilize my knowledge of sports for the greater good… my bank account. Call me whatever you want, but just know that I’ve made a killin’ the past few years playing these games. In a way, I suppose you could call it gambling. Yet, I don’t feel like I’m risking much. I know my stuff. I know what I’m doing. I win and I win regularly. Yahoo recently added a feature which allowed users to see their fantasy sports profile and here’s mine. I’m done writing, but I was reading this column entitled 100 Ways To Tell If You’re A Fantasy Football Addict and I had to admit that a lot of them apply to me. – You supplement your holiday budget with your winnings. – You haven’t made plans for the Labor Day weekend for a number of years because it would interfere with your draft. – You manage your workload around your online time. – You cheer for a player to do well because he is on your fantasy team, but not TOO well because he’s playing against your favorite team. – You wake up early to attend church service so that you can get back in time for game. – You listen to ESPN radio when it is so scratchy and out of range that you only understand about 1 of every 3 words, just hoping to hear those sweet little words; (INSERT NAME HEAR) just rambled in for his 2nd TD of the game. – Heading into Monday Night, you honestly think you’ve “still got a chance” because you’re kicker just needs seven field goals to put you over the top. – The only bookmarks you have saved on your home and work computers are FF websites. – You feel that you’re showing restraint when you only click “Refresh” only every 5 seconds on the Live Internet GameCast. – When Favre rolls out from the 1 yard line and throws a TD pass to Bubba Franks, rather than handing off to Ahman Green, you become so enraged that you start screaming obscenities. – You want your favorite NFL team to win, just as long as the opposing WR and kicker get you 25 points. – You refuse to divulge the name of the website that you get most of your information from. – Your household budget includes FF expenses. – You get less than three hours of sleep the night before your draft due to excitement and last minute changes with your cheat sheets. I couldn’t help but laugh when I read that column. Oh well, back to the drawing board. I’m sure they’ll be a few transactions within the next 36 hours that I need to pay close attention to for my live draft. It’s essential that I draft the right team to bring home that cake. Okay, it’s confession time. I can’t dance. I could never dance. I swear I was born with 2 left feet. I can bob my head to the beat at any point in time, but the rest of my body just doesn’t cooperate. I get out there and it’s like I stiffen up. I’m good for about the first 20 seconds, but then… it just gets ugly. Funny thing is that I can dance all over the house with no problem. I’ll throw on some old school jams and get to grooving. For some reason when I get into a public environment, things are totally different. Well, let me add a quick disclaimer to that. If given enough drinks, the dancing fool may appear at anytime. Under ‘normal’ circumstances, I’m the cat who’s holding up the wall or at the bar. I’ll just watch everybody else dance, sip on my drink and talk to whoever is around me. Going back to the days when I was a kid, I was never the one to dance. I did breakdance however and was pretty good at it. The summer of ’84 when Beat Street and Breakin’ were out, threw me in the mix. I learned how to do a lot of tricks and stuff and was pretty good at em if I was say so myself. I could do windmills, flares and handspins like it was nothing. One thing that I refused to even try though was the headspin. I wasn’t tryna bust my brain up. Anyway, I had the parachute pants and could slide and glide over a piece of broken down cardboard boxes with style and grace. I suppose that me being double jointed kinda helped a little bit. Oh well… so much for ’84. I’m a lot older now and a lot less limber. When I was in high school and attended house parties in the late 80’s, I wasn’t thinking about dancing like that to try to impress people. I just slow danced with the girls who would let me. However, I could never keep my hands where they were supposed to be and I got a lot of mean mugs and cold stares from girls back then. I was fortunate to never have been slapped. Lord knows I deserved to be, more than a few times. When I attended parties, I just used to run my mouth a lot and just talk to folks. Things have not changed one bit. I still go to clubs and parties occasionally and when I do, I’m up in there networking and making contacts. I remember one club experience that will always be fresh in my mind. I was stationed in Groton, CT while in the Navy in 1990. I went to the Officer’s Club with a couple of the guys one night. There weren’t that many fine sistahs in the place, but there were a few nice looking ones up in there. While sitting down at the table one of them came over to me and asked me to dance. So I got up and took her to the far corner of the dancefloor where it was real dark, cuz I didn’t want anyone to see me. The deejay started playing Parliament Funkadelic and the folks in there got real wild. Her and I danced for about 10 minutes and then I went and sat back down with the fellas. My man O’Neal called me out and said “Mo… you’re the only brotha from DC that I know who can’t dance” Needless to say the rest of the fellas clowned me on that that night and the next several weeks afterwards. So, the tradition continues ’til this day. I don’t dance and I really don’t care to dance. When I go places where people are dancing, I know my role… just be on chill mode. I could tell stories for days about times where folks tried to get me to dance and I either refused or I just made a fool outta myself. Sometime within the few months, I’m gonna have to learn at least some styles of slow dance. I’ve gotta do that so I’m not looking foolish and/or tripping over my own feet. Lord knows that I can’t be at my wedding reception looking like a total idiot during the first dance. But for now, I’mma keep doing what I’ve been doing for years. People laugh when I do it cuz they think I’m just playing around, but I’m really serious. I take my cues from the TV show What’s Happening and do my favorite dance… the Roger Thomas. The season is less than a month away folks and it can’t get here any sooner. I’m lookin’ forward to seeing my squad wreckin’ shop on the Deadskins and the rest of the NFL. Being a Cowboys fan is the DC area is a lot of fun. I love to antagonize fans of the bums who play their home games at FedEx Field. My ears are still bleeding after hearing them yapping the past 9 months about what happened last season. It’s cool though, let em have their fun. They get two back-to-back wins for the first time in 10 years and they’re celebrating like they won the Super Bowl. 10 Years!!!!!!! In the past 11 seasons the record is in favor of the Cowboys by an overwhelming 15-7. If I may say so myself… the ‘Boys have been killin’ em!!!! I’ve been having celebrations for the past 10 years, so it’s only fair to give them a few moments in time right? If you watched the movie The 40 Year Old Virgin, you’d recall the moment when Andy finally found the Promised Land. It was one of those moments words cannot describe. Well, the Redskins were Andy… they finally got some wins, so let em bask in it. 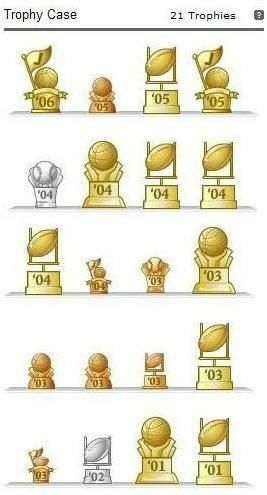 My ‘Boys have had their share over the course of the past number of years and aren’t hurt by the last two wins. Best believe that this season, things are gonna be different. They’re 15-7 against those bums since 1995, what does that tell you? I don’t need to go into details of the Cowboys acquisitions this past offseason, everybody knows we got a huge playmaker. The Redskins had their share of good moves as well, so it looks to be a very competitive season in the NFC East alone. I’m looking forward to once again standing upon the mountain top and yelling my favorite phrase “Hell to the Redskins”. I really hate em!!! The Cowboys will reign supreme once again. September 17th and November 5th are the days of destruction. When it’s all said and done, just remember that I told you so. 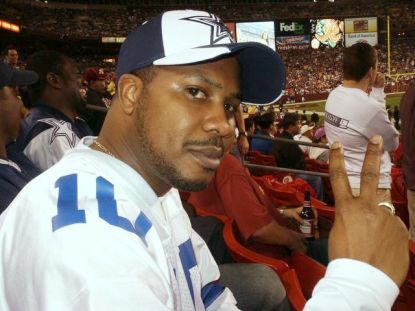 DC stands for Dallas Cowboys baby!!!! Generally I stop at the Giant or the Safeway as I’m driving into work. The grocery stores are quiet during those morning hours and I can pick up what I need relatively fast and get out. I’m addicted to sales however and always end up with more than I need. 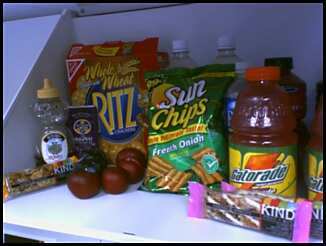 These items somehow find their resting place in my office or the fridge in the break room. I don’t worry about folks taking things though. In the four years I’ve been here I’ve only lost one Marie Callendar meal to some greedy thief. Anyway, I figured I’d do a quick inventory of what I had at my desk and this is what I found. Needless to say, I have a ‘few’ things. this doesn’t even count what I’ve got in the fridge…..
I’m in the grocery store this afternoon and I’m pushing the cart down each and every aisle as I customarily do. As I pick up the items that are on my list, I match them up with the coupons in my left pocket and cross them off the list stored in my mind. Along the way I pick up some things that are on sale that I probably don’t really need. Hey, when you can get a deal you take it right? Nothing like having a few extra snacks in the house for a rainy day… or a sunny day for that matter. It’s not my fault that they had a buy one/get one free sale on Edy’s ice cream. Plus, those blueberry muffins in the bakery that are $2 off the regular price aren’t gonna hurt me too bad. I mean, they’ve got blueberries in them and that’s a fruit. Anyway I get to the aisle where the detergents and cleaning aids are located and I stand there for a sec to refresh my mind as to what I need. I grab some Tide, a bottle of Downy and some Downy dryer sheets. I picked up a bottle of Lysol lemon cleaner and stood there for a moment trying to remember what else I needed. Oh yeah, I needed a pack of 2000 Flushes. I strolled over to the section where the toilet cleaning items were and did a quick inventory. Hmmmm… no 2000 Flushes. It was on sale that week and there were none on the shelves. The good folks in my neighborhood grocery store had cleaned up on that special. 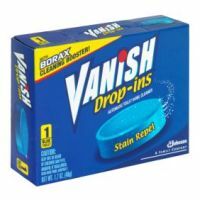 So I looked on the same shelf and saw Vanish Drop-Ins, Clorox Automatic X-14 and some other off brand toilet cleaning tablets. For some strange reason at that very moment a thought came to me. Why the hell did I need this stuff? Why was I so bothered by the fact that the toilet tablets that I wanted were sold out? Hell, with 4 bathrooms in the house I would need a few packs to keep things consistent. 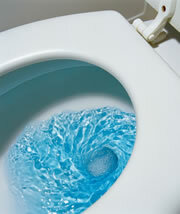 In fact, why was it so important that the toilet water was blue? What rocket scientist came up with that one? Don’t ask me why I had that epiphany right there in the grocery store, but I did. 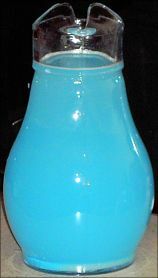 I really felt the need to know what brain surgeon came up with the invention that made folks rush to the store to ensure that their toilet water could be blue. Why not purple, pink or some other color? I mean, does it make folks feel better when they can’t see the color of the water when they pee? It’s not like we all don’t know what it looks like when we relieve ourselves during those restroom breaks in clear water. Why the need to camouflage it with blue water? Hell, it might be more scary for some to see the water turn green during the process. 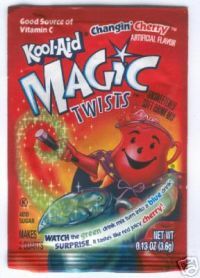 Then again some folks might get excited about the transformation as if it were a pack of Kool-Aid Magic Twists in a pitcher of water. Okay, okay, maybe that concept is a little bit crazy. For those true Kool-Aid fans out there, I apologize. We all do go to our own private restrooms solo I presume and we all flush the toilet afterwards correct? Look, I understand that the tablets are supposed to sanitize the toilet bowl and keep it smelling fresh and clean for the most part, but why the blue? Couldn’t they just have made them in clear tablets with the same chemical agents and achieved the same results. I know that some companies now make the clear bleach kind, but that’s not my point. 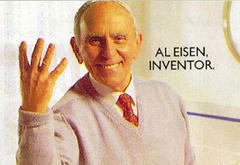 Were the tablets made in blue dye so that folks would feel better about knowing the toilet was clean. Come to think of it, every airplane or Amtrak train I remember travelling on on since I was age 7, had blue toilet water in their bathroom. This was really bugging me cuz it just didn’t make sense all of a sudden. Regardless of whether you use these ‘automatic’ bowl cleaning tablets in your toilet, it still needs to be cleaned. You can’t just throw some blue tablets in the tank and ABRACABABRA, the toilet cleans itself. You still need to have that brush sitting behind the toilet and some Pine-Sol or Lysol or whatever to disinfect that joint. Which brings me to another point, why do the blue tablets need to smell like potpourri now? Geez… I really wish to embrace the scent of flowers while I’m sitting on the can handling God’s business, as I like to call it. Will aroma of a spring meadow relax you and put you at ease during your session, as you sit there reading JET magazine? Regardless of the the scent, you had better be running that fan and have a candle burning or can of spray for the after effects if you’re in there after a less than stomach settling dinner experience. Aiiiight, enough on that. I dunno what’s up with me, I’m feeling really abstract today. I remember back when I lived in an apartment, the maintenance crew would fuss about us putting these things in the tank. They said that the bleach and chemicals could destroy the flapper which would eventually cause the water to leak continuously. 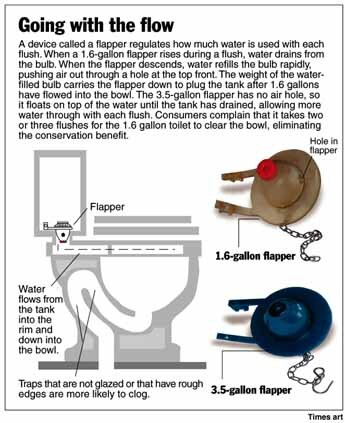 Furthermore the damaged flapper would lead to costly plumbing repairs and water leaking would produce a higher water bill. That didn’t matter to me back then, I wasn’t paying for anything except electric. But now, hmmmmmmm… you’re telling me that the water bill I get every three months from WSSC can be lower by now using toilet cleaning tablets??? I dunno about that. I suppose that there’s some truth to it. Anyway, I finished up my grocery shopping without getting a toilet cleaning tablet of any sort, paid at the register and began my drive home. I figured that I’d stop by the dollar store which was directly around the corner from my house to grab a few inexpensive things. I grabbed a box of Little Debbie Banana Twins (I know… more snacks), an empty spray bottle so I can mix my Simple Green concentrated cleaner in and some Ziploc sandwich bags. I’m on my way to the register to pay for these things and I pass by more cleaning agents. There I saw a twin pack of Blue2, an in-tank automatic bowl cleaner. What did I do? Yep, I picked it up and took it to the register with the rest of my stuff. Hey, it’s no 2000 Flushes… but if I can get 28 1/2 flushes out of each tablet… that’ll be aiiiiight.